Poverty is surging at Kimball High School in Dallas. Fifteen years ago, 57 percent of the families were economically disadvantaged. Today, it’s 83 percent. The Oak Cliff school is battling those numbers and turning around a dismal academic record — in part with its hospitality and tourism program. Delores White not only teaches a hospitality class for juniors at Kimball High but also runs the school’s four-year Academy of Hospitality and Tourism. White’s not shy — that’s when she took over. Under her direction, the program has earned “distinguished” status from the National Academy Foundation. She says this program helped restore pride in Kimball. That’s after the state ranked the school academically unacceptable for five out of six years. The National Academy Foundation partners with schools in high-need communities in 36 states and demands tough academic and professional standards. 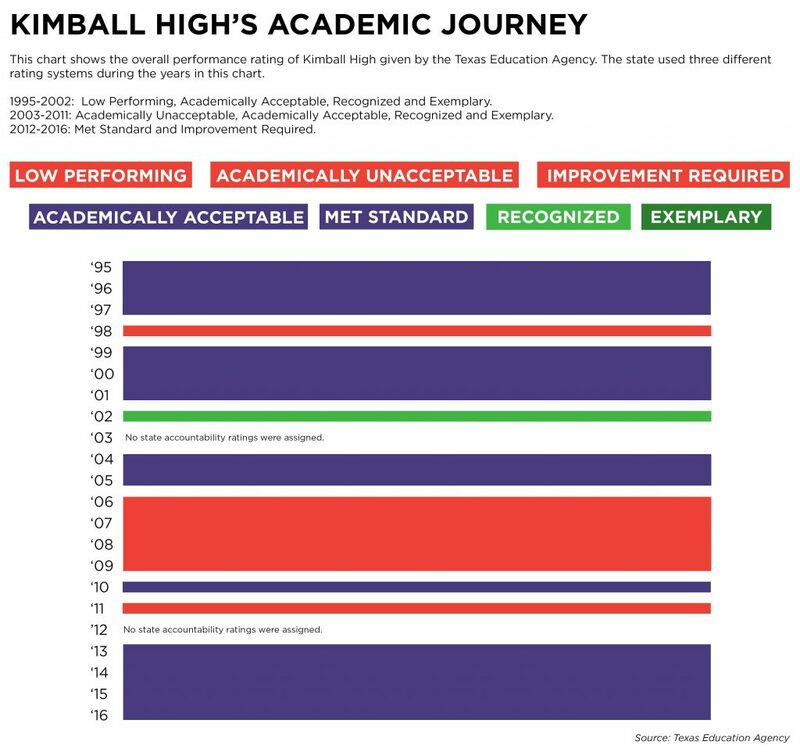 Kimball has been challenged by a growing number of charter schools. White’s confident about her program. Students like Kimball senior Shai Johnson aren’t shy, either. White is all about preparing students for college and business. For many kids, it’s a way up and out. While they won’t all end up working for a hotel or travel business, the lessons will stick, especially from internships that the program requires. Tia Crowe, a Kimball senior, was a paid intern at the Hotel Association of North Texas, and says it was a big deal. Francisco Gamez, a 17-year-old junior, is looking forward to applying for an internship. “To get real world experience on how a job should be and how it could be is definitely a great opportunity that they offer,” he says. First, he needs a suit. 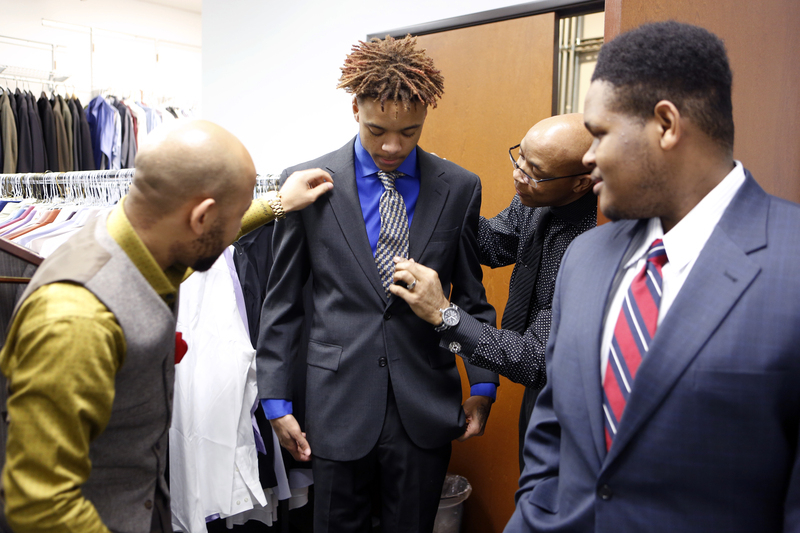 During a field trip to Workforce Solutions of Greater Dallas, he was measured for one. The job training center has racks and racks of business suits. That’s one reason Delores White brought 40 guys from the academy. These clothes are free, which suits Francisco. “A lot of us maybe don’t have exactly the finances for a suit,” he said. Neither do most kids from Kimball. More than 80 percent of the student body qualifies as economically disadvantaged. 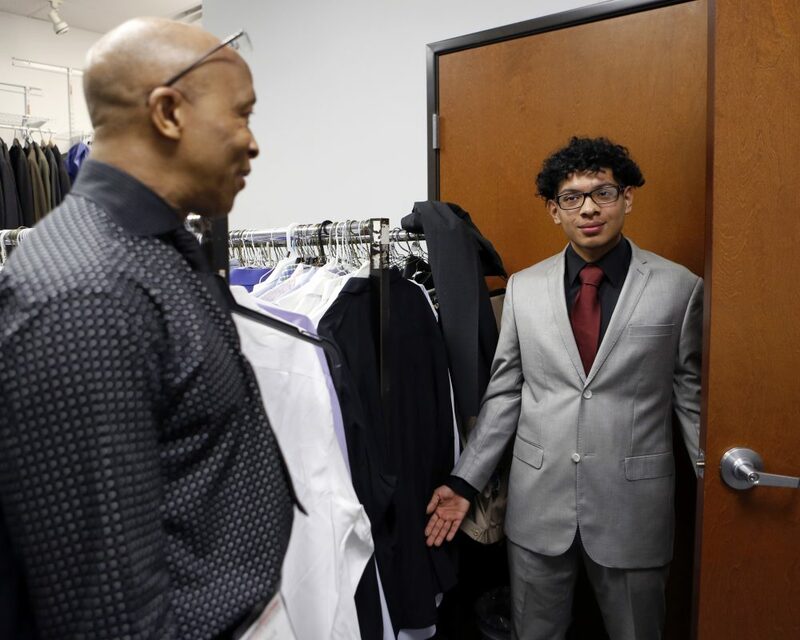 This is the first time Francisco’s ever been fitted for suit. There’s another first he’s dreaming of. “I would definitely love to be first in my family to go to college,” he said. Francisco’s parents, who are originally from Mexico, got as far as high school. That’s how Francisco sees Kimball’s academy. White says 75 percent of last year’s academy graduates got into college. That’s compared to about 50 percent district-wide. Four hundred students are now enrolled in the hospitality program, which is more than a quarter of Kimball’s kids. The academy is a good calling card for the school. Principal Llewellyn Smith says it’s time for more options. These days, Smith says, additional programs should add interest for students and parents. “This is what’s happening with this collegiate academy, academy of hotel and tourism, whether it be an academy of law or academy of engineering at a school,” Smith said. That collegiate academy starts next year and there’s already buzz, especially among teachers.